The station weighed close to 100 tons and was sent into orbit on May 14, 1973. It was followed that year by three manned flights using the smaller Saturn IB, each carrying 3 astronauts for a prolonged stay aboard Skylab. Those missions, designated Skylab missions 2, 3 and 4, lasted 28, 59 and 84 days, respectively. Today a back-up Skylab module is open to visitors in the National Air and Space Museum of the Smithsonian Institution in Washington (picture on the left). The orbit of Skylab was not high enough to avoid atmospheric friction, and over the years the station gradually lost altitude. A plan was made to to push it to a higher orbit with the space shuttle, but the first shuttle was not ready on time. Meanwhile the 11-year sunspot cycle advanced towards its peak, bringing a significant growth in the the soft X-rays and extreme ultraviolet (EUV) emitted by the Sun. Such radiations are quickly absorbed in the high layers of the atmosphere, which are markedly heated by the process. That heating makes the upper atmosphere expand upwards, increasing air resistance to low-orbit spacecraft, and as a result Skylab re-entered the atmosphere on July 11th, 1980. Most of it was burned up by atmospheric friction, but some pieces were recovered from the Australian desert. Mass measurements aboard Skylab were part of the medical experiments conducted there. Prior to the Skylab mission it was observed that both US and Russian astronauts returning from space had lost weight, and NASA worried whether this implied some physical deterioration which could grow worse on longer flights. Several reasons were suggested for this loss. Because of gravity, blood pressure is higher in the legs (just as water pressure is higher at the foot of a watertower than it is halfway up), causing a counterpressure to be exerted by blood vessels there. Some believed that in a zero-gravity environment, the extra load opposed by this counterpressure did not exist, causing more blood to be pushed into the upper body, and the body, sensing the extra blood, eliminated it, causing a loss of fluids. Others blamed unnatural meal arrangements and loss of appetite due to nausea (which some astronauts developed, but others did not). Still others felt that work in space tended to be unusually stressful. To better observe the process, Skylab carried three mass-measuring devices--two small ones (experiment M074) for measuring the intake and outgo of each astronaut, and a large one (experiment M172) with an oscillating chair, designed for daily monitoring of the weight of the astronauts. The motion of the oscillating mass was tracked electronically, typically over three back-and-forth oscillations, and from this the instrument derived the oscillation period T. Theory predicted that T would be proportional to the square root of the oscillating mass; this was confirmed by calibrations in space, using previously weighed objects, and those calibrations suggested that when carefully performed, such mass measurements were accurate within 0.1%. 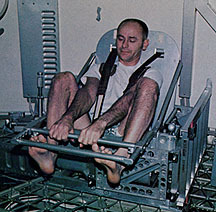 Measuring body mass in the M172 chair (see illustration) was not a simple matter. The human body is not rigid, and any internal motion--even breathing--could affect the oscillation of the chair. After emptying their pockets, astronauts would climb into the chair, always wearing a suit which had been weighed before the flight. They would then be strapped in rigidly, brace their feet against a bar at the front of the chair, grab hold of another such bar with their hands, hold their breath and then release the seat by pushing a trigger on the hand bar. Astronauts of Skylab-2 lost 3-6 pounds during their one-month stay, and measurements of intake suggested they were not eating enough. On Skylab-3 food rations were therefore increased, and additional excercises were also ordered, to make sure that "body muscle was not exchanged for fat." Weight loss was comparable, even though the stay in space was twice as long, and it was noted that most of the loss occured in the first five days. The Skylab-4 crew was given still more food and more excercises. All three astronauts of that group lost mass during the first 10 days, but for the remaining 74 days they held their own or even gained mass back. As for the reasons suggested for the mass loss, apparently all three of them contributed. On the effects of weightlessness in a space station: " Weightlessness and the Human Body" by Ronald J. White, Scientific American, September 1998, p. 58.
" Skylab, Our First Space Station" edited by Leland F. Belew, NASA special publication SP-400, 1977. The above illustration of the M172 mass-measuring chair appears on page 116.
" Skylab, Outpost on the Frontier of Space" by Thomas Y. Canby, National Geographic, October 1974. 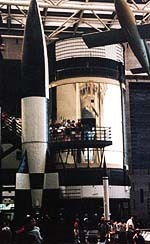 The "chair" shown above also appears there, at the top of the general view of Skylab on page 466.